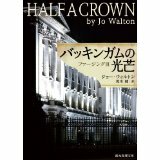 Half a Crown was published by Tor in 2008, and in the UK by Corsair in 2014. It was my seventh published novel. 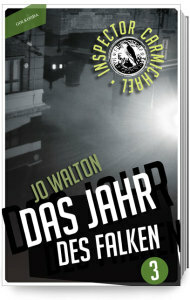 It has also been published in Japanese and Spanish and German. It won the Romantic Times Reviewer’s Choice Award in 2009 and was nominated for the Sunburst, Prometheus and Sideways awards. 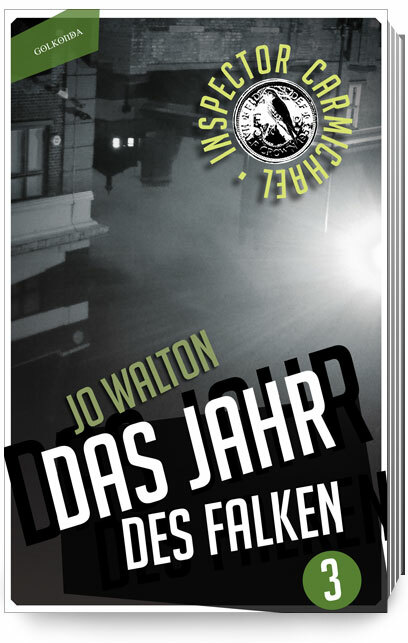 This is the third of the Small Change books, set ten years after the other two, in an alternate 1960. Like the others it alternates two points of view, Inspector Carmichael, now promoted to run the Watch, the British Gestapo, and his ward Elvira, passing time as a debutante until it’s time for her to go up to Oxford. Elvira has grown up with fascism and thinks it’s fun. I had the idea for this book at the same time as I had the idea for Ha’Penny. In my head, there was one book and then suddenly there would be three. I knew how it ended — the same way that fascism ended in Spain. I knew the Duke of Windsor would be in it, and I knew what I wanted to do with Elvira. The rest of it I had to figure out, especially the alternate history of ten more years. I had to do a lot of reading about the real fifties and the thirties and forties too, to see how else things might have gone. I probably did more straight out research for Half a Crown than anything else I’ve ever written. I began it on December 6th 2006 and finished it on July 8th 2007, in 39 writing days. Escape to Other Worlds With Science Fiction, a short story on Tor.com set in the US at the same time as Half a Crown. Interview at Locus that talks about Half a Crown. Q 1: Isn’t the end a deus ex regina? A. Sure. But it’s what happened in Spain. Q 3: But I’m American and I thought monarchy was horrible! A. Well, monarchy can be a defence against the right, because it’s a symbolic thing that appeals to the same things — patriotism and tradition and loyalty, without being necessarily part of the other things the right is part of. See Spain. And the Netherlands. And Denmark. And separating the head of state from the head of government does lead to less of a weird attitude to the head of government, who is inherently political. Q 4: Who is that singer from Liverpool? A. John Lennon. He was born before the change point. I didn’t name him because I’m uncomfortable writing about real people, and because it would have been too much of a distraction. Q 5: Did I spot a James Tiptree Jr reference? Q 6 Did I miss a James Tiptree Jr reference? Q 7: Why did you nuke Miami? Q 8: Why don’t you like the Duke of Windsor? A. I started off entirely neutral on the Duke of Windsor, with a vague positive feeling about giving up kingship for love. Then I read his autobiography. Never was a man so condemned out of his own mouth. He was scum. Spoilt, entitled, selfish, wanting to have his cake and eat it and with no sense of his obligations to his country or to anyone else. Did you know that the profiles of monarchs on British coins have alternated left and right profiles since William the Conqueror, and Edward VIII insisted on breaking this alternation because of his stupendous vanity? Also, he was deeply sympathetic to fascists. Also, great love affair nothing, during WWII he left Wallis Simpson alone for months at a time while he went off to the US where he wasn’t supposed to be. He wanted all the advantages of being king, even after he had abdicated, without any of the disadvantages, ever. He was a thoroughly despicable individual. Thank goodness we got rid of the slimeball. But don’t take my word for it. Read his autobiography, and if you can still stomach the man after that, get back to me. Q 8: Why are you so mean to Carmichael? A. I realised as I was writing this book that all Carmichael wants is to be a series detective in a normal detective series. It’s his tragedy that he wound up in mine instead.